Every great era of horror is marked by at least one film that is so unlike its contemporaries that it is often not given its due importance. This is especially true of Edgar G. Ulmer's The Black Cat, and it's a shame, too, as it is one of the finest genre films made by Universal Pictures. 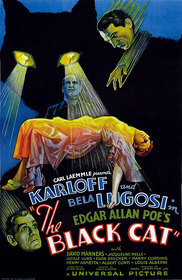 The Black Cat is also notable in that it pairs Boris Karloff and Bela Lugosi for the first time. Although several collaborations would follow, this is the most interesting as it is the only one where each actor has equal importance. Later works would typically see one playing second banana to the other (unless they don't even share a single scene, as in Black Friday). 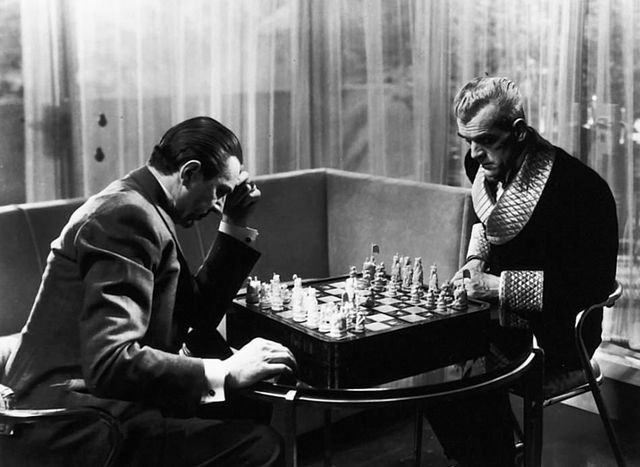 Fifteen years after he was made a prisoner-of-war by his general's betrayal, Dr. Vitus Werdegast (Lugosi) has tracked down the traitor, Hjalmar Poelzig (Karloff). Inside Poelzig's art deco abode (built on the foundations of the fortress he once commanded), the two wage a battle of wits, with the lives and souls of a stranded newlywed couple (Jacqueline Wells and David Manners) as the wager. Ulmer fills each scene in the Poelzig house with a palpable feeling of doom (in fact, the film's re-release title was House of Doom). Part of this was creative editing and lighting. From the first moment we see the bizarre looking Majordomo (Egon Brecher) to Hjalmar's intense silence as Werdegast speaks to him for the first time in fifteen years, there's an eerie feeling in the air. There's a brilliant montage of faces in the Mass sequence that is simply unnerving. The house itself is quite the chiller. Composed of geometric shapes and jagged edges, it makes Dracula's castle look almost cozy by comparison. This is where death lives, and he has a insane interior decorator. The altar that Poelzig utilizes late in the movie must have been designed by Frank Lloyd Wright under commission from Alestair Crowley. Of course, the studio imposed a few items of questionable merit, most notably the brief "comic" sequence involving a pair of bickering gendarmes. Also, it seems likely that Universal hacked this film to bits. Running barely over an hour, it's short even by the standards of the time. "We shall play a little game, Vitus. A game of death, if you like." Bela Lugosi and Boris Karloff in Edgar G. Ulmer's The Black Cat (1934). 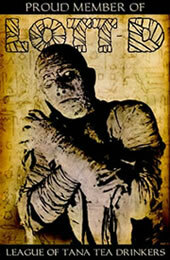 Publicity photo from doctormacro.com. Karloff truly carries the dramatic impetus of the film, despite the fact that his role has the same weight as his co-star's, speaking from strictly narrative standpoint. He was always a better actor than Lugosi, and The Black Cat is all the proof one needs of that fact. His metered line delivery, his coldly lusting eyes, his sinister lisp, the nearly seductive way he pronounces 'horror,' are all essential to the portrait of a man who may be the very image of the devil (kudos to Jack Pierce for the great makeup work). This is not meant as a slight to Lugosi's contribution, though. This is among his finest hours, so if he suffers a little by comparison, the film isn't harmed too badly. Indeed, in his favor, he uses his heavy accent to his advantage, giving shades of obsession to otherwise meaningless sentences (you'll never hear the word 'baloney' the same way again). His Werdergast is patient, infinitely so, and one is given the impression of a man who would wait fifteen more years if it meant that he could perfect a way to destroy the will and resolve of his foe. Wells spends much of the film unconscious, screaming, or in the embrace of the man she loves. She's no different than half-a-dozen other Universal heroines. Manners, on the other hand, is an ineffectual oaf, trying to bring a light touch to a film consumed with a feeling of dread. This a fate all too typical of Manners, who bluffed his way through Dracula '31 and The Mummy '32 in much of the same way. There have been numerous interpretations of the film's proceedings. Some have been a bit "out there," some have been rather pedantic. 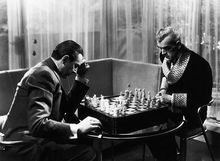 It think that the game of chess played by the adversaries is central to any reading of The Black Cat. Even as Poelzig manipulates everyone around him like a piece in his game, he is beyond realizing that he, too, is being played. Werdergast and Poelzig, I have always believed, are meant to be the pawns of two greater foes - God and Satan. The shared fate of the two, then, is fitting, as if the world can only exist with either both or neither. For Karloff/Lugosi goodness, some people prefer The Raven '35. I myself care less for that film. There is nothing, nor ought there be anything, that compares to The Black Cat. It is unique experience unto itself, and a film Universal fans should go out of their way to see. It's simply magnificent. Submitted by Alphawolf (not verified) on Sun, 2015-07-19 12:14. The best of their collaborations.......the explosive climax is to die for.